Title: The new Apple iPad line-up. Simplicity is gone. Tonight, Apple presented the world with its refreshed iPad line-up. But choices haven't become simpler in the process. If you now walk into a store to buy an iPad, you have to choose between 40 (!) different models. There are 16 types of iPad Air. You can choose whether you want Wifi only or Wifi + Cellular. You have to choose the storage amount: 16GB, 32GB, 64GB or 128GB. That's 2 x 4 equals 8 models. And then there's 2 times that, because you've got the choice of either white or black. 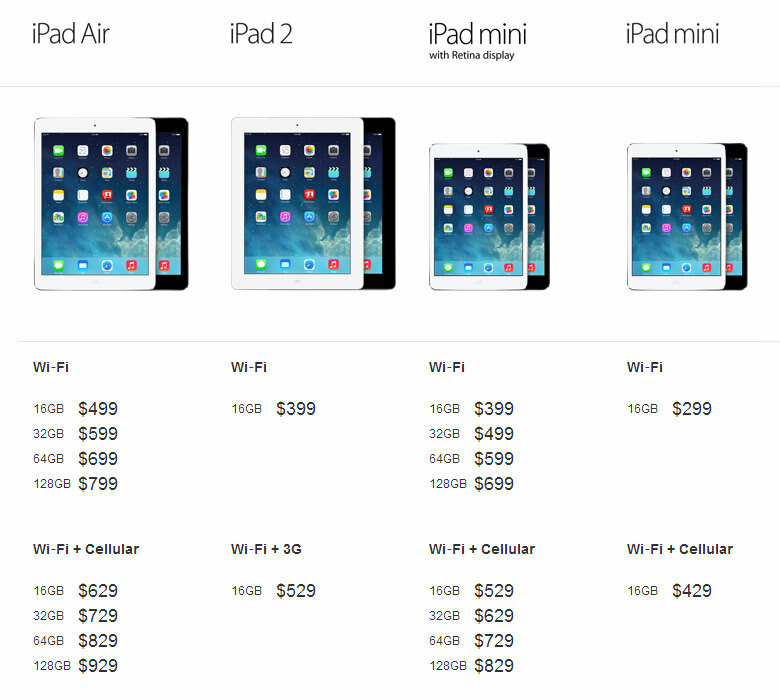 That makes 16 new iPad Airs, with the most expensive option costing $929. Brilliant. Then there's the new iPad Mini Retina, with exactly the same (amount of) options, so that adds up to 32 models. Nice. Of course they kept around the older iPad Mini as an entry-level model from $299 up. This one only comes in 16GB, but can have either Wifi only or Wifi + Celullar. And of course it ships in black and white. Add another 4 models. We're now at 36 iPads. And then there's the oddball. The iPad 2. Because of some mysterious reason, Apple decided to ditch the iPad 3 and 4, and keep selling the iPad 2. They're selling it from $399 up. And gladly, they limited the choices to the same options as with the old iPad Mini. So. There we have it. Now selling 40 different iPads. Wasn't Apple always about simplicity?